The Cobra Museum of Modern Art is located in Amstelveen, a 25-minute bus, tram or metro ride from Amsterdam. 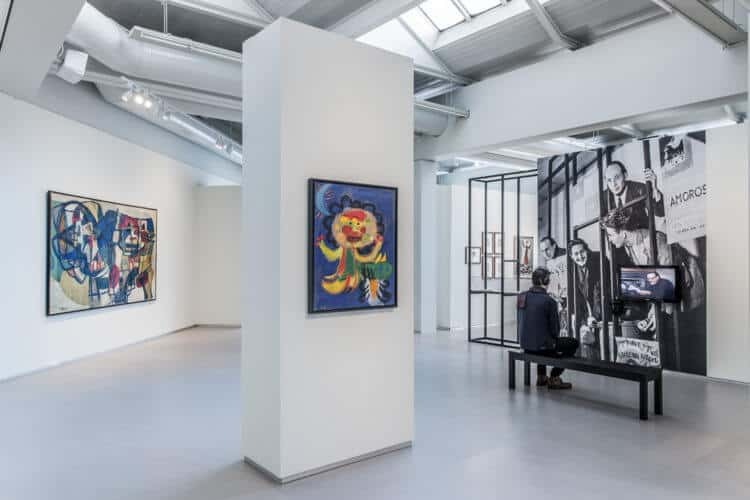 The Cobra Museum in Amstelveen showcases a collection of art from the Dutch avant- garde art movement Cobra. Cobra paintings are usually colourful, playful and bright. The simple and childlike portrayal of the world is influenced by folk and primitive art, myths, animals and child’s paintings are much portrait. Juan Miró was a big inspiration. Cobra’ is the name of a group of artists from COpenhagen, BRussels and Amsterdam (hence the name) founded in 1948. Original members were Asger Jorn (Danish), Christian Dotremont from Belgium and the Dutch painters Karel Appel and Corneille. Their unity was short lived, lasting only until 1951. Cobra rebelled against the academic rules and intellectual boundaries after World War II had shown ‘intellect’ can be harmful. Creative expression and spontaneity and the anarchist ideals of Cobra led them to experiment with different materials and cooperation between painters, poets and sculptors. Most famous Cobra artists from Holland are Karel Appel and Corneille. The inner courtyard is designed as a Japanese zen garden. It was designed by Tajiri and it shows a haiku, referring to the 4 elements. Outside of the entrance of the Cobra Museum Amstelveen is a 5 meter high sculpture made by Karel Appel, The Fountain. The fist in the fountain symbolizes power. The bird represents freedom. Cobra Museum of Modern Art in Amstelveen is located next to the central busstation of Amstelveen. There are many buses to this station from Amsterdam. There is also a tram(5) and metro (51) from Amsterdam Central Station. It’s best to change to the tram 5 if you take the metro. Get out at Amstelveen Stadshart. From the tram stop it’s a 10 minute walk through a modern and very big shopping centre. The Cobra museum in Amstelveen is open from 11.00 am to 5 pm (17.00 hours). It is closed on Monday. Entrance to the Cobra Museum in Amstelveen is €12 for adults. Ages 12 – 18 pay only €7,50. Free entrance with the I Amsterdam City Card. Read more about Amsterdam city passes. The Cobra Museum also has temporary exhibitions. Check out what’s on this year in the Amsterdam exhibitions calendar.